This fee is automatically charged and removed if shipping to a cold climate. 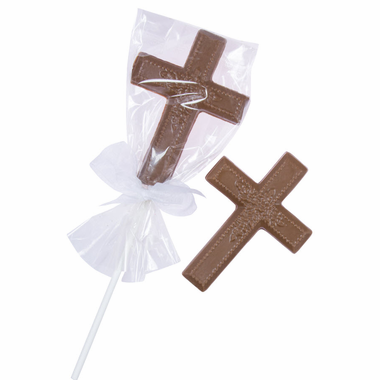 An sweet child's First Holy Communion is the perfect occasion to give our chocolate Communion favors cross lollipop. It is made from high quality chocolate, created and hand-poured fresh to order. 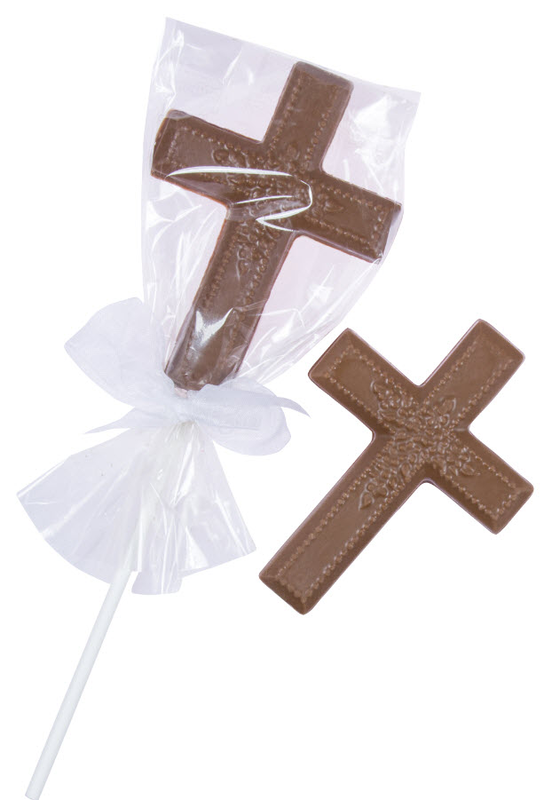 Each chocolate cross weighs 1.25 oz and measures 4" tall x 2.75 " wide and is wrapped in cello with an organza ribbon. SHIPPING DURING WARM WEATHER REQUIRES A MAXIMUM OF TWO DAY SHIPPING AND AN ADDITIONAL COLD PACK CHARGE OF $10.00. ALSO, WEST COAST ORDERS MAY REQUIRE ADDITIONAL SHIPPING COSTS. PLEASE MAKE SURE THAT THE PACKAGE IS RECEIVED BY SOMEONE OR PICKED UP PROMPTLY. WE CANNOT BE RESPONSIBLE FOR MELTED ITEMS.